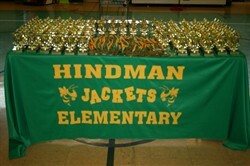 Founded in a rich tradition of community pride and excellence, Hindman Elementary boasts the largest Knott County Elementray enrollment with 544 students serving grades K-8. The administration, faculty, and staff work together to foster success in each and every child and promote the needed skills to become effective citizens of the 21st Century. We are proud of our school, it's students, and our community support. Please use the links to the left to navigate our site and enjoy the accalades and accomplishments of our school! Students who received a Distinguished or Proficient on the 2010 CATS state assessment were awarded for their outstanding achievement. All Distinguished students received a trophy, while all Proficient students received a medal. 2nd place title in Duet Acting. in the TOP 24 in the state in Prose. in the TOP 24 in the state in Poetry.